Zest orange and set zest aside. Place cranberries in a large pot on medium low heat. Add 1/4-1/2 cup of water, vanilla extract, salt and orange zest. Cook for 10-20 minutes, stirring occasionally until the berries pop and soften. 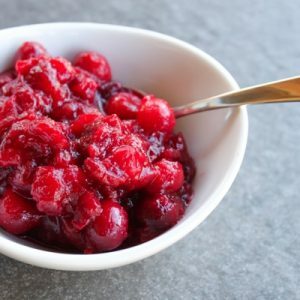 Wait until you have the texture you like–I like some whole cranberries still–then add your sweetener of choice. Just like any sauce, it tastes better the next day! Store covered in the fridge.